This compact device equips you with 11 unique bass synths. 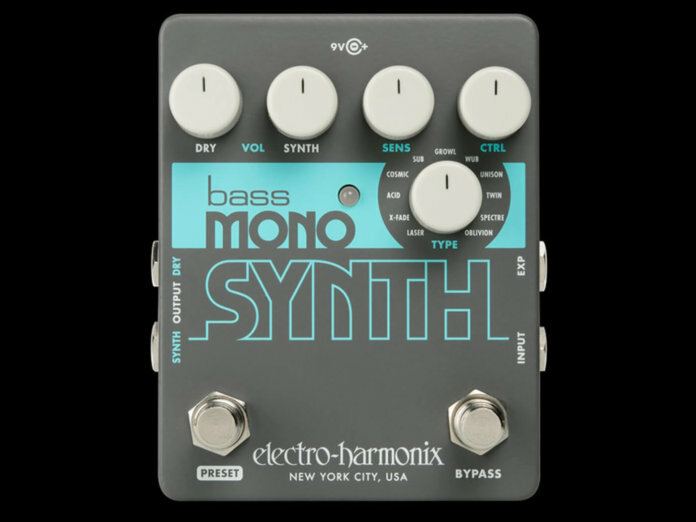 EHX keeps the NAMM ball rolling with the Bass Mono Synth. This multi-talented stompbox comes kitted out with 11 bass synth options, including vintage synth emulations, thick and saturated voicings, as well as deep, bellowing tones. Diving into the pedal’s controls, tone sculpting begins with the Type knob, which allows you to cycle through 11 presets – from Laser to Oblivion. The Ctrl knob then modifies a key parameter in the selected preset. This, of course, varies from preset to preset. The Dry and Synth knobs can be used together to set the mix: the former governs the volume of the dry bass signal, while the latter sets the synth’s volume. The Sens knob, on the other hand, enables you to configure the pedal’s responsiveness to your playing dynamics. If you prefer more real-time control over the pedal, you can hook up an expression pedal through the EXP input. Last but certainly not least, the Bass Mono Synth features a Preset footswitch that allows you to save and recall presets with the push of a button. Available early February at $123.50. More information at ehx.com.